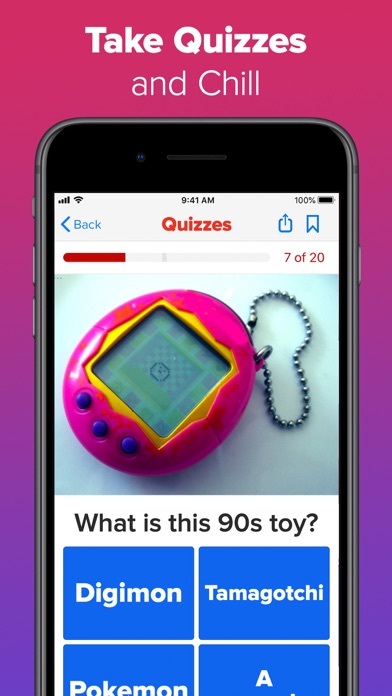 BuzzFeed has it all: the stories and quizzes trending on social, the news you want now, and the recipes and life tips you didn’t know you needed. 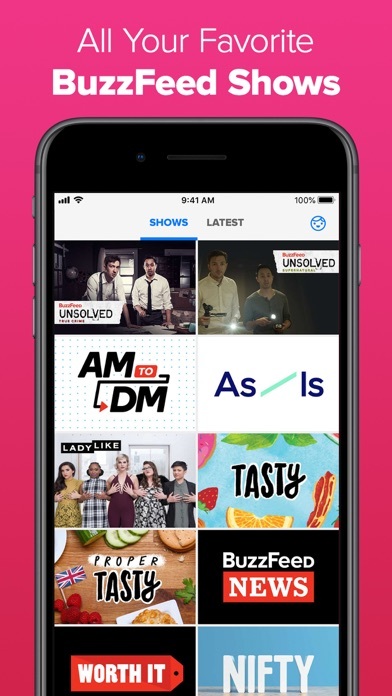 FEATURES: • Never be bored again with the best mix of News, Videos, Quizzes, and Lists • Watch your favorite BuzzFeed shows like Tasty, Nifty, Goodful, Try Guys, Violet, and Ladylike • Use the Explore tab to dive into your favorite topics like Food, Celebrity, Animals, DIY, LGBT, and more • Use the Trending section to see what stories are about to go viral • One tap to share stories with Email, Messages, Facebook, Twitter, Pinterest and more • Share individual images and videos from within stories. Just tap the image for options! 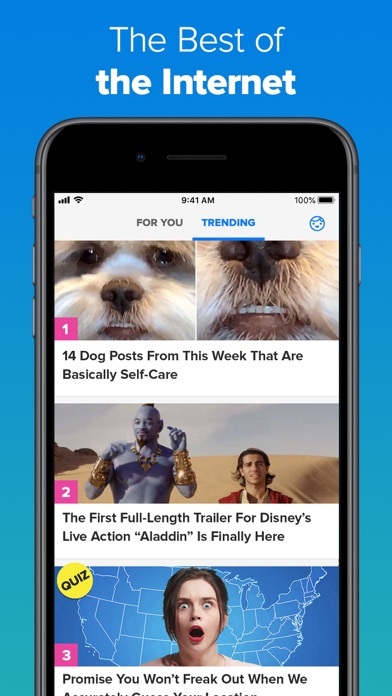 • Bookmark posts you want to come back to and sync them with all your devices • Get push notifications for trending stories so you’re always in the loop • Comment on a post or click the reaction button to share your opinion If you have any trouble with your app please email us at [email protected] so we can help! And don’t forget to check out BuzzFeed.com when you’re on your laptop! Note: Our properties may also feature Nielsen's proprietary measurement software which may contribute to market research, like Nielsen's TV Ratings. Nielsen's software may collect your choices with regards to it. i cannot sign in. every time i’ve tried with different emails and it continues to say “missing_params”. i have emailed them multiple times over the course of 4 weeks and they have not yet replied. I really like BF good content and a good slant on the writing,buzz feed is my go to news outlet. I do not like the fact that I cannot leave a comment because I don’t have Facebook. The majority of your articles prohibit me from commenting because of no fb ???? I love how they have quizzes. I like to take the love quizzes and see if he likes me. Hopefully there right! I love reading the comment section! Also please less quizzes. I was reading and article and wanted to see other people’s opinions on the topic of the article, however when I scrolled to the bottom of the article to read the comments I noticed the option wasn’t there at all. Is this a bug or on purpose? If it’s on purpose I have to say that I prefer the ability to read comments on all articles not just some. Freezing freezing freezing freezing freezing freezing freezing freezing and it’s freezing! The app is visually appealing, easy to use, and overall a good experience. I love going on buzzfeed when I’m bored at school or in a waiting room, stuff like that. I’ve made account so I can like, comment, and bookmark stuff for later. My only complaint is that every time I update the app, it logs me out and I have to log in again. It’s minor, but I have a lot of passwords to keep track off so it’s kind of a hassle to have to go and look for my login info. 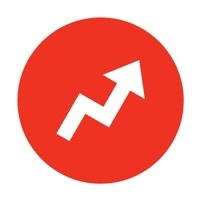 Overall I think buzzfeed is really entertaining and I definitely recommend! I absolutely love the app; it is much easier than retyping the web address each time. The only thing is that I barely use it. I only use Buzzfeed for the quizzes, and I only do them when I’m bored, so it’s more of one of those games that sits in the back of one of my folders for a month or say before I remember it’s there, but I love it nonetheless! Love this app! When you click on your account icon, a sub menu comes out with “bookmarks” and “recently viewed”. Maybe add in an option to view the articles where you have commented? I always have to bookmark the articles where I comment so I can go back and see if anyone responded to it. Too often I search in the app and results come up for articles that are not in English, and of course there is not a feature to translate them, so I have to waste time picking through the results for something I can actually read. I’ll open the app and scroll for 5-10 minutes and it absolutely drains my battery. Coupled with the fact that while I’m scrolling, it makes my phone burning hot to the point that it force closes the app...I had to delete. Literally half (maybe even more than half) the reason I use the buzzfeed app is to read comments on each article. Please bring them back or I don’t think I’ll continue to use it. If you asked me a week ago, I would have given the BuzzFeed app 5 stars. However, there was recently an update that got rid of the comments for 95% of the articles. One of my favorite parts of the BuzzFeed experience was reading the comments to see what other people think! I really do miss doing that, so if this issue is not fixed soon, I don’t see myself using BuzzFeed nearly as often. That being said, if you’re not a comment person, this is a good app to scroll through when you have free time. It’s a nice blend of actual, relevant news and fun, light-hearted content. Give it a try. I can no longer see comments on 90% of the posts I view. BuzzFeed, I adore you, but you need a few fixes. 1.What’s happening with the comment section?! It’s missing on certain articles. Are you purposely disabling comments? 2. Why don’t I get a notification somewhere in the app if someone reacts or comments back to one of my own comments? The only way I know if anyone has responded to me is to go back and look. 3. Can we please not have to click on a Twitter link that takes you to another page just to read the entire status?? 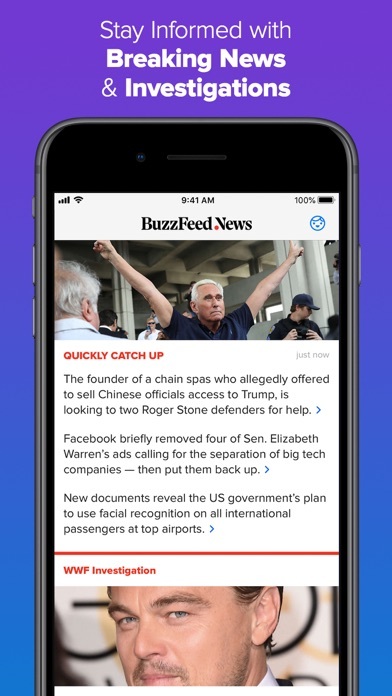 I want to stay in the BuzzFeed app, not have to go to another site. Bring back the comment section! I use BuzzFeed way more then I should, and one of my favorite things about it is how interactive it is. But lately many articles have the comments completely turned off. It’s very frustrating and honestly if it is not just a glitch and it continues I will stop using the app nearly as much as I do right now. Otherwise, it’s a very fun app to get celebrity and entertainment news on, and I really enjoy a lot of the quizzes and polls. But the community is half the fun and taking away the comments takes that away too. I want the comments back on articles! The comment section within the app has completely disappeared after the most recent update. The comments were some of the best things to read! Where has the comment section gone? I loved reading the opinions there as much as the articles. I like the app and its content and I use it both on Android and iOS but the comments plugins are the worst. I log in via Facebook, which is what it is, but half the time, the comments section for Facebook doesn’t allow me to post. I get logged out all the time and when I log back in, the Facebook comments section is just a spinning wheel. With the latest update (installed for me on 4/9/19), Facebook comments have completely disappeared from all articles. Also, would it kill you to allow commenting on ALL articles? There will always be trolls, but on such a liberal forum, you’d think we would be able to comment freely whether we sign in via Facebook or not. I deleted the App because they started disabling the comments. The comments were usually more interesting than the articles. And often had more information! The quiz and answers are cut off after the new update. With the newest handful of updates, comments on articles have been spotty and sometimes nonexistent. Also the constant recycling of articles several times has gotten so old that it might be time to find a new pop culture outlet. I found so many things I’d been looking for, or wished that they existed, and bought them all. Thank you so much. Can’t like the comments by Facebook users anymore and any comment left disappears!!! Started with these problems a couple weeks ago. Uninstalled and reinstalled. No difference. The comments won’t load and you’re not able to post any either. This is an issue that others have as well going by the recent comments in the reviews but Buzzfeed has yet to address it. Your readers’ eyes will thank you. I absolutely love BuzzFeed. It’s a great way to pass the time and most of the content is quite entertaining/useful. However, lately I’ve noticed that a lot of the articles are old ones that have been retitled to make you think it’s new content when in reality it’s not. Under the TRENDING tab...there’s content from as far back as 2015...this is extremely frustrating...if you don’t have new things to report on, then just don’t report at all...don’t repost things from YEARS ago and try to pass it off as new...and if you are gonna do that, at least make it content that’s worth while. Can't seem to like, reply, or load additional comments even though I'm logged into my account. It used to work fine before the most recent update. Please fix!! I can’t see all the comments whether it be from the site or from Facebook. Also, your videos just won’t load. Jesus, pictures won’t even load when I’m on WiFi. Fix your content! Not only that, but make sure your “writers” and “editors” proofread their articles. I was an English and Journalism major and I’m shocked at how many errors go though in a daily basis. Seriously, it’s embarrassing to see simple spelling and syntax errors that are so botched by your “reporters” and “authors”. I used to love you guys, but you’re slowly backpedaling. Buzzfeed is simple and to the point! It encompasses all genres. We really enjoy it and never a day goes by where we don’t find something serious or funny to talk about as a family! This app has constant issues when it comes to posting comments. First off, it will say you need to log in to post when you’re already logged in. If you log out, then log back in, it will still say you need to log in. Then if you do manage to post a comment. They will mysteriously disappear within a couple of minutes, if they show up at all. If you mean to have a comments section. Then you should make sure it works! By Best game for iPad! This is THE BEST app ever!! 10/10 love it! Could you guys use SEO when looking up things in the app...when you search things irrelevant topics/articles arise!! I enjoyed all the quizzes and ways to upgrade my lifestyle, but there is too much political stuff that I don’t care to see. There news isn’t factual and is opinion based which I don’t want to see on my phone. Such a shame. Could we get Google sign in option so I can sync between my Galaxy S9+ and iOS, that would be great. I don’t know what it is, but I’ve never been able to make an account on any device. I’ve tried with Facebook, Gmail, iCloud. When I went to click the account activation link, it brought me back to the app and said my attempt to confirm my account failed and also said, “MISSING_PARAMS”. I am on iOS.